If you use Google Toolbar for Firefox only because you like the bookmarking feature, there's a much better option: GMarks. While there are other extensions that provide an interface for Google Bookmarks, John Marshall's GMarks adds a lot of value to Google's basic bookmarking service. 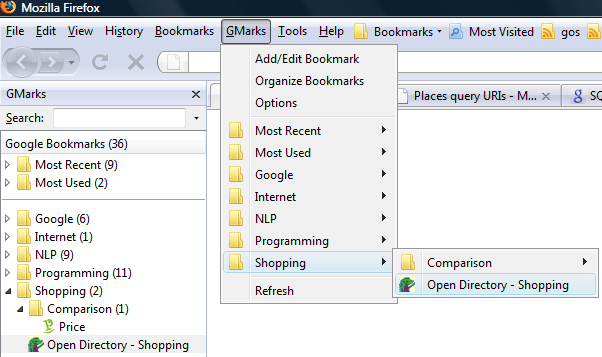 GMarks can display the bookmarks almost the same as Firefox's native bookmarks: in a separate menu and in the sidebar. There's also a dropdown that can be added to Firefox's toolbars. The sidebar is useful when you want to perform full-text searches in your bookmarks without having to visit Google's site, while the GMark menu has an excellent option for managing bookmarks. If you click on "Organize bookmarks", you'll be able to import bookmarks, edit or delete bookmarks and create Gmail-like filters. For example, you can automatically add the label Google for any bookmark from this blog. The extension can show the number of bookmarks for each label, a list of recent bookmarks and the most frequently visited bookmarks. To bookmark a page, use the familiar shortcut Ctrl+D or the GMarks menu. One of the most frequent user requests for Google Bookmarks is nested labels and GMarks uses a little trick to simulate hierarchical labels: separate the labels with >. For example, if you want to label a bookmark as Shopping and Comparison, where Comparison is a sublabel of Shopping, just enter Shopping>Comparison when you create the bookmark. Since Google Bookmarks doesn't support this feature, the labels will appear to be nested only in GMarks. And the cool features don't stop here: the extension suggests labels based on the web page's title, you can hide the bookmarks that have certain labels and there's an option for integrating the starred items from Google Reader. Since the last time when I wrote about GMarks, the extension added the most interesting ideas implemented by the "competition" and managed to become THE Google Bookmarks extension. If there's anything that could be added, maybe it would be useful to completely replace Firefox's bookmarking system by hiding all the interface elements related to the native bookmarks and replicating all the changes to Google Bookmarks locally. Couldn't agree more. I've been using GMarks for some time now and just love it! It would be nice if it could "usurp" the "Bookmarks" menu in Firefox though... I often find myself accidentally clicking "bookmarks" and not finding what I want. GMarks lets you edit urls too, which is a major pain in the next with google bookmarks. Personally, I like Shareaholic better. I use Google Bookmarks because I don't want to deal with the drop down / folder structure of Firefox Bookmarks. I want something simple and fast, and that's exactly what Shareaholic gives me when used with Google Bookmarks. But can it do keywords? That's my favorite feature in Firefox's bookmarking system. I love GMarks as well. If I could have only one extension in Firefox, GMarks would be it. I like GMarks, but what if you're using Google Notebook to organize your bookmarks? That's what I do, and only my unfiled bookmarks show up in GMarks? Is there any solution to this? yes, indeed GMarks is my most favorite firefox addon. Using GMarks, is there a way to know in advance that a page i'm watching is already on my Google Bookmarks? How can I get Gmarks to openn in my sidebar? 2) I hope to have it show bookmarks in other notebooks other than unfilled, but I haven't had the time. 5) It can't highlight things on pages because google bookmarks can't. That's something more for a google notebook extension to do if it wants. thanks John for this fantastic add-on. It is so nice to store bookmarks online with google, and access them on four different computers. I especially like you nesting feature. With the number of bookmakrs I have it would be unwieldy to see the mall in a flat view. OMG! You mean to tell me this has been out there this whole time, and I'm just now finding out about it? AHHHHHHHHH! Wow; to have missed such a jewel!!! I've been using GMarks for a while also, it's the first add-on I install when I install Firefox on a new machine. I have a small problem with Firefox 3 though. It seems I've lost all the icons in GMarks. I've tried refreshing with no luck. If I add a new bookmark I get the icon but my existing ones are gone. Anyone? I just can't understand why Google doesn't work on a REAL bookmarks service. They should admit that GBookmarks it's very limited. At the moment they also have Google Notebook, not a good bookmarks manager, and Google Sync, that it's closing and never worked well, once never had an online dashboard. 1. when using a shared computer, even if you are logged in on a Google service, and you have the "Automatically log in" checkbox marked in Gmarks, you have to go and click on the button to login in GMarks (it does it automatically, though, when you have logged in Google with "Remember me on this computer"). Deng Google Bookmarks works automatically as soon as you are logged in Google in Firefox. 2. Just as the web site for Google Bookmarks, intranet links or links to other protocols than http don't work (I use links to Notes documents notes://). They do work with Deng. I did a tour of every bookmark solution for Firefox and really wanted something Google compatable. I didn't like GMarks because 1 I couldn't use keywords or keyword searches (my favorite Fx feature) without making two copies of my bookmarks which defeated the purpose. 2 couldn't use the new Fx 3 bookmark features. I settled on Foxmarks. My only complaint is that it's not Google but even I don't think that's a good reason. i added gmarks, started to use it and LOVED/LOVE it. sometime after i did the latest firefox upgrade (at the time), i noticed that some of the gmarks i created when i first started gmarks are lost/misplaced? i reinstalled firefox and put it in a new folder i created but was unable to retrieve all of my old gmarks (most are there). how do i retrieve ALL of them? Gmarks is awesome FF addon but I am concerned about privacy issues. What does John Marshall do with our gmail accounts and passwords? Please advise. All-in-One Sidebar I think is the best. It imitates Opera's sidebar showing history, downloads and bookmarks. It can be opened by a side button on the page margin. But most important to me; it lets you manage bookmarks in the traditional folder style. Like most users, I haven't got time to reconfigure my work around new-for-new-sake updates. I want what I am used to, what works and to be left alone to get on with life. The only reason I had to uninstall it was that it would 'grab' my bookmarks(not allowing them to go to the normal bookmarks) and on top of that (most important) WOULD NOT ALLOW TO ADD A KEYWORD. Without that, Firefox is not Firefox. Last time I used GMarks was with Firefox 3.6. * and I'm sad to say that, I too, have had problems syncing with the google server. I can't even drag and drop the bookmarks anymore into GMarks. They don't show up. I wonder if it's either a capacity problem, an addon problem, or just Google Bookmarks. Google has implemented updates regarding that section of their site, and it's looking really good. I just don't want to go to that URL all the time to look for a bookmark I need. I want an addon that syncs great with the website, and stores them without any disappearing into thin air. I therefore experiment some issues on windows 7, the bookmarks buttons does not expand sometimes. Yeah, I used GMarks almost exclusively rather than in-browser bookmarks until I updated to Firefox 4.0. So far it is incompatible. Are there plans to update? Or would the author like to suggest an alternative? I have a problem with GMarks on Firefox 14. It can not connect to my google account. additionally, I can not open google search whit GMarks installed. Disabling it solves the problem. Unfortunately, it's all moot now, because Firefox 57 no longer supports XUL-based add-ons and (so far) nobody has ported GMarks to the new Web Extension API.